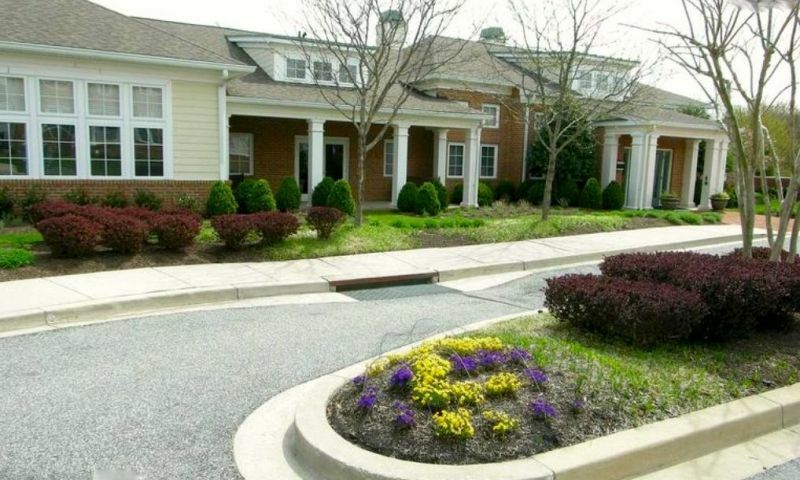 The Enclave at Ellicott Hills is a 55+ community in Ellicott City, Maryland. Active adults can enjoy low-maintenance attached homes and condos, great recreational amenities, and a quiet neighborhood setting. Conveniently located in Ellicott City, residents have easy access to Route 70, US Route 40 and Route 29 with nearby attractions in Washington D.C. and Baltimore. Active adults at The Enclave at Ellicott Hills can enjoy great amenities to stay active and busy all year long. The 6,200 square-foot clubhouse is the perfect place for residents to gather with neighbors or get involved in a new activity. The clubhouse features an exercise room with the latest cardiovascular and weight-training equipment as well as an aerobics room. Residents can relax in the social lounge, or have some fun with the card tables. They can also read a good book or check their email in the library. A catering kitchen is available for homeowners to utilize. Outside amenities are sure to please 55+ residents as well. They have access to an outdoor swimming pool, patio, tennis court, beautiful courtyard, open natural spaces, and walking trails. There is also a children’s pool for when the grandkids come to visit. The Enclave at Ellicott Hills was built from 2003 to 2013 and offers a total of 280 residences. Homebuyers can choose from condo units built by Bozzuto or attached homes built by Chateau Builders. All homes are available on a resale-only basis. There are 164 condo units in The Enclave at Ellicott Hills. These elegant condos feature elevator access and ample parking spaces on a lot. Condo units have two or three bedrooms and two bathrooms. They offer approximately 1,600 to 1,800 square feet of living space. Condo units feature open floor plans, hardwood floors, custom window shutters, spacious master suite, and walk-in access to the deck. Homeowners also have a beautiful outdoor courtyard, secure access to the building and an inviting lobby area. There are six attached home models for homeowners to choose from in this 55+ community. These villa townhomes feature two-story living with unfinished basements and first-floor master suites. They have two to four bedrooms, two-and-a-half to four-and-a-half bathrooms, and an attached one or two-car garage. These homes also include private courtyards, great rooms, separate dining rooms, loft areas, and dens. Homeowners can also personalize their home with optional features like screened porches, expanded sunrooms, and much more. Active adults can participate in social activities at The Enclave at Ellicott Hills. They can play tennis or card games, take an aerobics class or organize a community party. The Enclave at Ellicott Hills provides the perfect setting for homeowners to get involved with neighbors at the clubhouse for seasonal events that foster life-long friendships and helps build strong ties within this 55+ community. An annual homeowners' association fee takes care of lawn maintenance, snow removal, amenities, clubhouse and common ground maintenance. This age-restricted neighborhood is a few minutes from the Historic District of Ellicott City, ten minutes from Columbia, and 20 minutes from downtown Baltimore. Plenty of other attractions include parks, golf courses, shopping and restaurants. Driving around town is a breeze with quick access to major highways like Route 29, Route 70, and US Route 40. For farther travel, residents can board a flight at Baltimore/Washington Thurgood Marshall International airport. With a variety of home designs, great amenities and a convenient location, homeowners can enjoy an active lifestyle in The Enclave at Ellicott Hills in Howard County, MD. Clubhouse - 6,200 Sq. Ft. There are plenty of activities available in The Enclave at Ellicott Hills. Here is a sample of some of the clubs, activities and classes offered here. There are 164 condo units built by Bozzuto in The Enclave at Ellicott Hills. These elegant condos feature elevator access and ample parking lot spaces. Condo units have two or three bedrooms and two bathrooms. They offer approximately 1,600 to 1,800 square feet of living space. Please Note: Floor plans are not available at this time. There are six floor plans for homeowners to choose from in The Enclave at Ellicott Hills. These villa townhomes were built by Chateau Builders and feature two-story living with unfinished basements. They have two to four bedrooms, two-and-a-half to four-and-a-half bathrooms, and an attached one or two-car garage. 55places.com is not affiliated with the developer(s) or homeowners association of The Enclave at Ellicott Hills. The information you submit is distributed to a 55places.com Partner Agent, who is a licensed real estate agent. The information regarding The Enclave at Ellicott Hills has not been verified or approved by the developer or homeowners association. Please verify all information prior to purchasing. 55places.com is not responsible for any errors regarding the information displayed on this website.